The states divide into 2 groups: Passes and Options. Disabled none Material is not rendered during the pass. Default default Material is rendered during the pass. Disabled disabled A background texture is not used. One texture single One background texture is used. Two textures double Two background textures are used. All the other options can be either enabled or disabled by ticking the respective boxes. Passes specify during which rendering pass the material should be rendered. They are modified in the Passes field of the States tab. Ambient ambient Ambient rendering pass. Specifies, how the material should be rendered during the Ambient light pass for the opaque objects. The actual opacity or transparency of the material depends solely on the set blending options. Light world light_world World lights rendering pass. Specifies, if the material should be rendered illuminated by the World light sources during the light and shadows rendering passes. Background background Enables a cube map texturing of the sky sphere. This option allows to use static sky images, for example, to create a night sky with stars. Clouds clouds Specifies if the procedural clouds will be rendered. The depth value can be set using Interaction parameter. This option allows to avoid moire patterns on the objects. The following textures create textured sky sphere clouds and are modified in the Clouds field of the Textures tab. Mask 0 mask_0 Mask for the 1st upper cloud layer. RGBA. Mask 1 mask_1 Mask for the 2nd lower cloud layer. RGBA. Clouds 01 clouds_01 Noise texture for the 1st upper cloud layer. RGBA. Clouds 23 clouds_23 Noise texture for the 2nd lower cloud layer. RGBA. These textures are present depending on the Background option selected. Background 0 background_0 A cube map for texturing the sky sphere with a static texture RGBA. Background 1 background_1 A second cube map for texturing the sky sphere with a static texture RGBA. Textures transformation parameters are modified in the Transform field of the Parameters tab. Volume volume_transform expression Transformation of the volumetric clouds mask. Noise noise_transform expression Transformation of the volumetric noise texture. Mask 0 mask_0_transform expression Transformation of the mask texture mask_0. Mask 1 mask_1_transform expression Transformation of the mask texture mask_1. Clouds 0 clouds_0_transform expression First transformation of the cloud texture clouds_01. Clouds 1 clouds_1_transform expression Second transformation of the cloud texture clouds_01. Clouds 2 clouds_2_transform expression First transformation of the cloud texture clouds_23. Clouds 3 clouds_3_transform expression Second transformation of the cloud texture clouds_23. 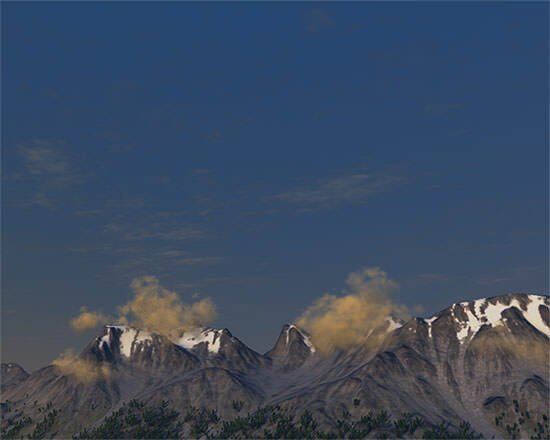 Volume parameters control the appearance of volumetric clouds. They are modified in the Transform field of the Parameters tab. Clouds parameters control the appearance of textured sphere clouds. They are modified in the Clouds field of the Parameters tab. Sphere parameters are modified in the Sphere field of the Parameters tab. Backgroud 0 and Background 1 parameters are present only if Background option is set to One Texture or Two Textures mode respectively. Background 1 background_1_scale slider Color multiplier for the second background texture. Interaction parameter is present only if Soft interaction option is enabled and is modified in the Soft interaction field of the Parameters tab. Shadow parameter controls the appearance of shadows from clouds and is modified in the Shadow field of the Parameters tab.